THE BELL above the door jingled, and Vixen let out a sigh. Showtime. With a broad smile, he left his comfy spot by the window where he’d been watching the snow fall and made for the bar as the White Hart erupted into laughter and chatter. He took a seat on one of the red-and-gold stools, smiling while his Rein Dear brothers flooded in and crowded him. 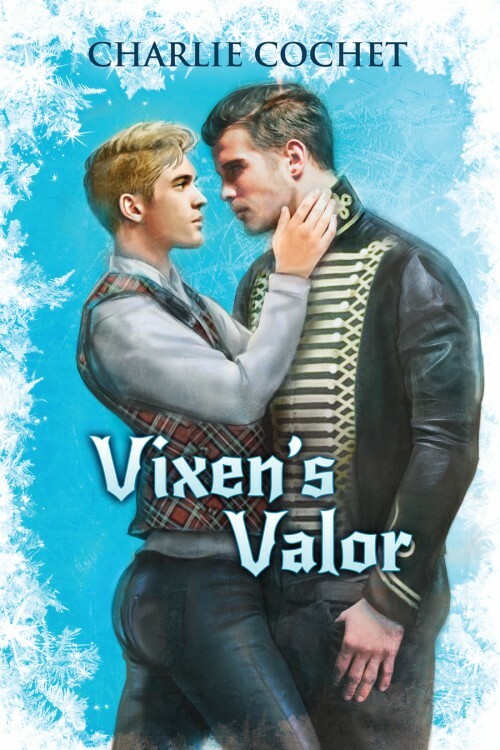 Dasher—the eldest and more brash of their Rein Dear brothers—threw an arm around Vixen’s shoulders and took it upon himself to order enough drinks to get the entire Toy Soldier army merry. He pushed a peppermint julep in front of Vixen and gave him a hearty pat on the back. Vixen took his peppermint julep and swallowed it in two gulps. One more day of fun before he was meant to be on his best behavior. So many silly rules. Not that Vixen ever followed many. “Hey there.” A pretty toy soldier in a bright red uniform with gleaming gold buttons and shiny black boots leaned on the bar beside Vixen. He had a smooth jaw and deep, dark eyes. “Well hello,” Vixen purred. He raked his gaze over the dark-haired elf. Promising. Very promising. Well. Well. Well. Vixen leaned in with a sultry smile. “And just what kind of services might you be offering, Officer Fern?” A lustful look came into the elf’s dark eyes. A tingle went up Vixen’s spine, and he licked his bottom lip. Oh, how he liked a naughty soldier. Vixen opened his mouth only to have Rudy wedge himself in between them. His infuriating friend dropped down onto the stool between Vixen and the handsome—not to mention willing—toy soldier. With that big grin of his at full force, Rudy turned to the toy soldier. Officer Fern looked somewhat puzzled before nodding and silently walking off. Vixen was fuming. He opened his mouth, and once again, Rudy cut him off with a quiet hiss. Almost a year ago Jack Frost had nearly lost his heart to the ice after Rudy’s plane had been sabotaged, leaving Rudy injured. Healed by Mayor Kringle, Rudy had been determined to save Jack and in the process discovered a hidden power within himself, one that summoned fire and warmth. Either way, it was just another thing Rudy possessed that Vixen didn’t. Bah humbug. He worked just as hard as Rudy. Sort of. Maybe not as hard as Rudy, but he worked hard. So what if Vixen liked to enjoy himself when he wasn’t being the darling of North Pole City along with his brethren? “What has to end? My fun? Why must you always put a damper on my festivities?” Not a year went by where Rudy didn’t harp on about Vixen’s behavior. If he did tend to partake in certain festivities a little more the closer it got to the Big Flight, then it was due to the amount of pressure the event placed on him. Surely, of all elves, Rudy understood. The whole world was counting on them. The happiness of millions. That was a lot of responsibility to place on an elf’s shoulders. Vixen felt somewhat guilty, though he didn’t know what for. He didn’t want his friend getting so upset or worried, but Vixen wasn’t doing anything wrong, merely having a little fun. When had that become such a terrible act? The question caught Vixen by surprise. “What about him?” He finished his drink and ordered another. Yum. His favorite. Mistletoe Martini with plenty of kick. If only his best friend would have a drink—or several—and loosen up a little. Vixen took several sips of his fruity drink, feeling marginally better. “Sure, he’s quite handsome, but he’s too timid and quiet.” After the incident, he hadn’t given the lieutenant much thought. He was a member of the Frost family, and everyone knew what pleasant personalities they all had. Vale did seem to be less ill-tempered than his brother Hollis and cousin Jack, but he was still somewhat of a wallflower. “A chance for what? True love?” Vixen frowned. “Not everyone is looking to get their wings clipped, Rudy.” His friend’s face turned nearly as red as his hair. It was quite the sight. Rudy was renowned for his red hair. It was the reddest and brightest in the kingdom. Personally, Vixen thought it made his friend’s head look like it was on fire. Vixen was quite happy with his own tamer caramel-colored locks. “Maybe, but I know how to have a fabulous time. And this exchange is anything but.” Vixen finished his drink and, with a smile, held his hand up for another. “Fine. Have it your way. But I’m begging you. Take things slow.” Rudy looked as if he wanted to say more but instead walked off. A moment later, Dasher took his place. The bell above the door jingled somewhere behind Vixen, and Dasher gave his shoulder a nudge. Vixen turned in time to see Jack and the Frost twins walk through the door. He had to admit it was quite a sight. Jack was at the front dressed in his regal black uniform, the expanse of his chest impressive. Silver braiding adorned the jacket of his uniform as well as the white-furred pelisse hanging off one shoulder. More of the same braiding was on the red cuffs of his sleeves and stiff red collar. The twins wore similar uniforms but with gold braiding instead of silver. Lieutenant Vale certainly cut a fine figure in his royal uniform. His Hessian boots were shined and spotless. His black trousers and matching jacket were pristine. Gold braiding adorned the front of the jacket along with the sleeve cuffs and high collar. A black-furred pelisse hung off one shoulder, the gold braiding matching the rest of the uniform. He and his twin weren’t as tall as Jack but no less imposing. His pitch-black hair was neatly parted, his silvery-gray eyes, sparkling. 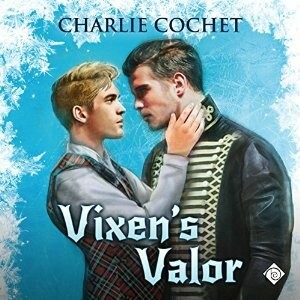 He had a full mouth and a chiseled jaw, and when he noticed Vixen eyeing him, his cheeks turned a lovely shade of pink. “What I wouldn’t give for a romp in the snow with the twins,” Dasher murmured over the rim of his glass. “Dasher!” Cupid’s cheeks flushed bright red as he fidgeted uncomfortably where he stood. Their smallest Rein Dear brother was easily scandalized. Then again, Cupid was the only Rein Dear who was part winter faery—and he looked it, too, with his wispy blond hair falling over his brow, his rosy complexion, pouty lips, and soft features. Blitzen—who was the complete opposite of Cupid in every way, from his large stature to his somber expression—gave them a disapproving glare from over Dasher’s shoulder. Holy holly, he was just as much a stick-in-the-mud as Rudy. “Well, I don’t like to brag—” Vixen was swiftly cut off by Dasher. Why would no one let him speak this evening? He needed another drink. No, he needed to find Officer Fern. “Humbug. You love to brag,” Dasher teased. “You know I have my heart set on a prince.” Vixen had never told Rudy because he knew his friend would only give him a disapproving frown, undoubtedly accompanied by another lecture. Ever since Vixen had been a tiny elfling, he’d dreamed of the day a prince would sweep him off to his castle, showering him with gifts and undying love. Then everyone would see how special Vixen was. He had been once, back when his parents had been warm and loving, doting on him. They’d adopted him when they discovered they couldn’t have elflings of their own. He’d been so happy. Everything he did had brought smiles to their faces. They’d clapped and cheered, given him hugs and kisses, told him how special and wonderful he was. One day, a Christmas miracle happened. His parents had an elfling. A boy. After that, it was as if Vixen didn’t exist. Nothing he did would make them look at him the way they looked at their new elfling boy. They hadn’t been cruel to him, merely indifferent, which had felt just as terrible. Everything his brother did was always better. In their parents’ eyes, his brother could do no wrong. They’d given him everything that had once been Vixen’s, even his room. He’d misbehaved to see if maybe then they would look at him, but it only made things worse. So when he was old enough to enter the Rein Dear Academy, Vixen ran away, lied and forged their signatures, believing if he became a Rein Dear for Mayor Kringle, they’d notice and be proud of him. They never bothered. Vixen felt the back of his eyes sting but pushed it away before anyone could notice. He worked so hard but never heard a word from them, so he’d decided to forget them. All he ever wanted was for them to love him as they once had. He’d show them. As soon as he found his prince, the world and his parents would know how wonderful and special he truly was. Vixen gaped at Dasher. “That’s an awfully mean thing to say.” Not that Dasher had ever been one to mince words, but it still hurt to hear. This evening wasn’t going at all as planned. All he’d wanted was to get merry and perhaps join a toy soldier for a frolic or two. Dasher continued as if Vixen hadn’t spoken. “Thank you for the support,” Vixen muttered. He stood and headed for the tufted, red-velvet loveseat in front of the fireplace. On his way there, he caught Vale Frost’s eye and gave the elf his most charming, come-hither smile. Then he sat down, crossed one leg over the other and waited. Seconds later, a figure hovered to his right, and Vixen held back a smile. As Lieutenant Vale walked over to sit, Vixen discreetly nudged over, so when Vale sat, they were almost touching. With a timid smile, Vale cleared his throat and faced Vixen. Vixen leaned in a little closer. “Likewise, darling. Where have you been hiding yourself?” He gingerly reached out and smoothed out Vale’s pelisse, amused at the subtle fidget from the heroic lieutenant. “Don’t be silly. I had the Big Flight and then the celebrations that came after, plus all the post-flight procedures, the preparations for the next flight, the appearances, the charity events, the interviews, and so on. You know being a Rein Dear is very demanding.” His hand came to rest on Vale’s leg, and Vixen did his best not to laugh at the way the elf’s eyes widened. “That’s all right. How about you make it up to me?” Vixen said, his tone low and sultry as he ran a finger up Vale’s leg. “I’ll be there,” Vale replied with a broad smile. “Something bubbly.” Vixen gave him a wink and was forced to bite down on his bottom lip as Vale backed up and turned, colliding with the loveseat’s armrest. Embarrassed, he motioned awkwardly to the seat. “I didn’t see it. Excuse me.” With a bow, he quickly strode off toward the bar. Dasher’s voice whispered hoarsely in his ear. Vixen looked up at his Rein Dear brother and gave him a wicked grin. “He’s completely smitten. Just you wait. By the time the Big Flight comes around, I’ll have him wrapped around my finger.” He could just see the headlines now. For once, he’d be on the front page instead of Rudy. Finally, he was about to get what he’d always wanted.